This is the first time Jane Campbell has earned the Player of the Week Award in her career. 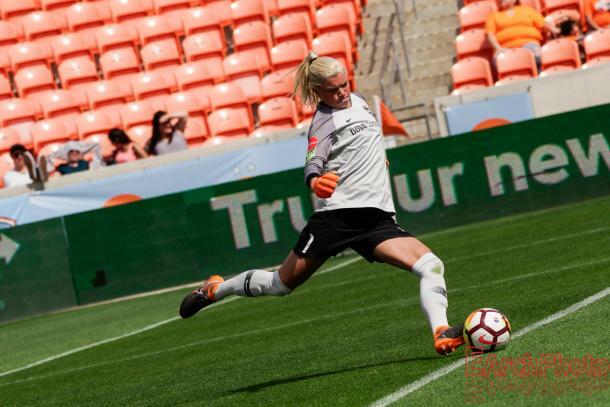 The National Women’s Soccer League writers association has voted Houston Dash goalkeeper, Jane Campbell, Player of the Week for Week 17 of the 2018 season. The Dash goalkeeper stop all nine Washington Spirit shots on goal on Sunday morning in Washington. The 1-0 shutout earned Campbell her second clean sheet of the season and helped claim Houston’s sixth win of the season. 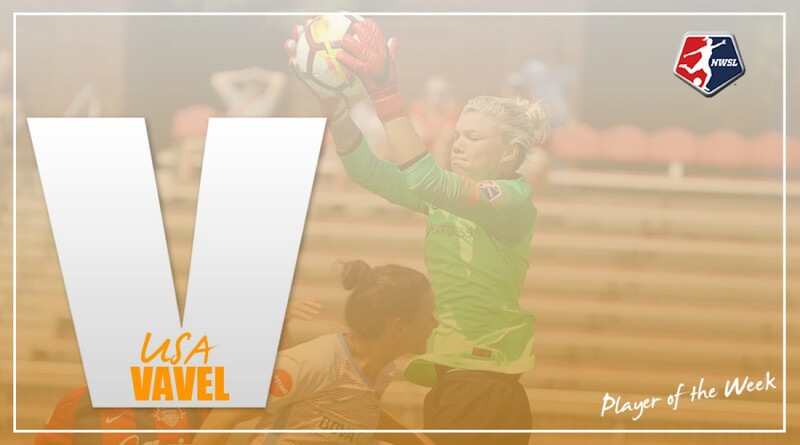 The victory also allowed Houston to leap over Utah Royals FC for sixth in the table (6W-7L-5D) and six points out of the last playoff spot (23 points). Campbell was tested in the first minute in the match against Washington. Francisca Ordega got off two shots on goal that Campbell had to be sharp on. Argentina international Estefanía Banini and Taylor Smith combined to fire two more shots on Campbell in the 8th minute. Banini had the best chance for Washington in the first half near the penalty spot that Campbell collected to deny the midfielder. The best save by Campbell came in the 81st minute from reigning Rookie of the Year Ashley Hatch. Hatch blasted a right footed shot from outside the box heading for the corner of the net, that forced Campbell to go full extension on to deflect it away. Campbell and the Dash were able to hang on to earn the victory keeping their playoff hopes alive. Campbell joins teammate Rachel Daly as the second Houston Dash player to earn Player of the Week honors this season. Daly earned Player of the Week award in Week 9. After the FIFA international window, the Houston Dash will return to action when they play host to Utah Royals FC on August 5. The match will be a must win for both squads if they hope to keep pace with the teams in contention. The NWSL Player of the Week is selected each week of the regular season by the NWSL writers association, a collection of writers that cover the league on a consistent basis.